Maurice Rose was the son of a rabbi and was born on November 26, 1899 in Middleton, Connecticut. His father Samuel and mother Katy were immigrants from Poland and had 2 sons: Arnold and Maurice. In 1902 the Rose family moved to Denver, Colorado where they had a dress-design shop. Maurice was 8 years old when he fired a gun for the first time. Though his father dreamed as a youngster of a military career, he did not want his son to do so. Nevertheless Maurice volunteered for the Mexican-expedition of General Pershing at age 15. After several weeks he was sent home after the army discovered he had falsified his age. 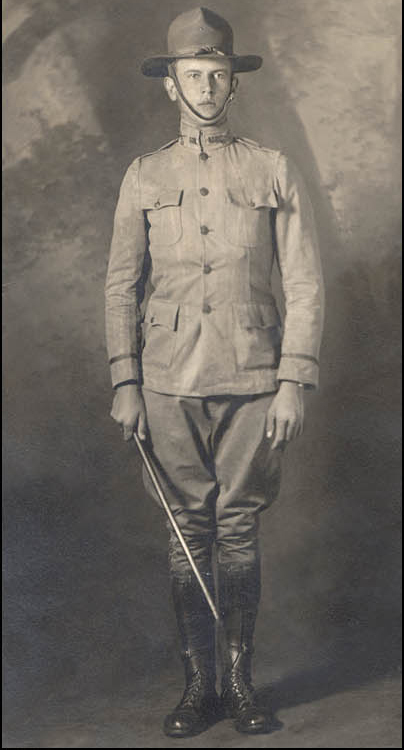 When the US entered WW1 at 6 April 1917, he enlisted and was accepted for the officers training school. At age 17 he was 2nd lieutenant, at the end of WW1 he was a Captain. Rose, at the age of 17, was about to become a 2nd Lieutenant and graduate of First Officers Training Camp (FOTC) at Ft. Riley, Kansas, as the U.S. Army was rapidly expanding to enter World War I. Back in the US in 1920, he worked as a salesman for a meat company, but he soon returned to the army. He started as a 2nd Lieutenant again but in 1941 he was a Major and he anticipated the importance of armored warfare. In 1942 he was Lieutenanr-Colonel and chief of staff of the 2nd Armored Division at Fort Benning, Georgia. With this unit he took part in the invasion of Africa in 1943, here he was awarded his first Silver Star and promoted to Colonel. Prior to the invasion of Sicily he was promoted to Brigadier-General and in Sicily he was awarded his second Silver Star. In november 1943 he returned to England in preparation of the invasion of Normandy. 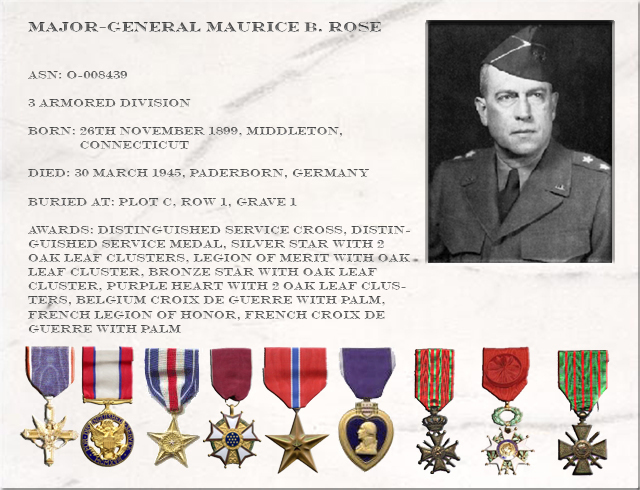 On June 7, 1944 Brigadier-General Maurice Rose landed with his 2nd Armored Division in Normandy, on June 12 he struck hard. He was send to help the hard pressed 101st Airborne at Carentan and forced the Germans back. 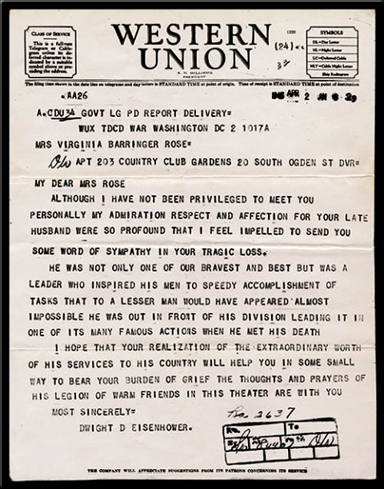 Captured documents later showed that General Rose's audacity may have saved the whole Normandy beachhead. The papers disclosed that Carentan was the planned target for a major German counterattack intended to turn the Allied flank and clear the beaches. On August 7 he took command over the 3rd Armored Division, which was engaged in the Falaise pocket. Here he was awarded the Distinguished Service Cross. In September he reached Belgium, like always Maurice Rose was in front of his Division and his jeep was the 3rd vehicle to cross the border. In Belgium he took Mons. The Germans hoped to break out to the Siegfried-line through Mons, but they did not know that the 3rd Armored Division was already in position. Rose set up the trap and waited. The Germans rushed into the trap and that day the 3rd Armored Division took over 10000 Germans as prisoner and killed many more. This loss caused the Siegfried-line to be undermanned. On September 21 they reached Stolberg, Germany. 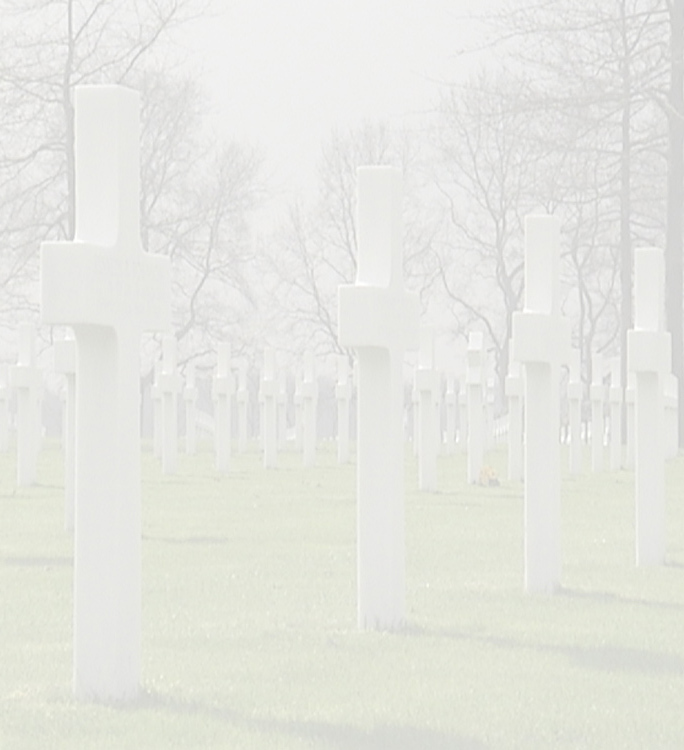 They were still here when the Battle of the Bulge began. The 3rd Armored rushed back to Belgium to stop the German breakout. On Febraury 7 they were back at Stolberg and 30 days later they took Cologne. Here they rested for several weeks untill the next assignment: The Ruhr. On March 25, 1945 they crossed the Rhine and rolled into the heart of Germany. On March 29 the 3rd Armored set the record for the greatest one day advance in the history of mobile warfare. 90 miles! The next day, again with a great advance, they closed in the entire German "Armee Gruppe B" in the Rose-pocket. 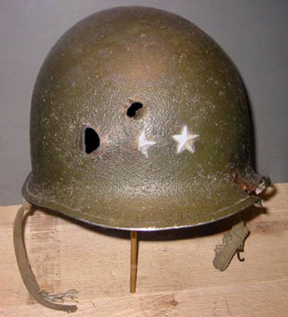 The 3rd Armored Division was activated on April 15, 1941 in Camp Beauregard, Louisiana. After many months of exercises the division departed to England for the Normany invasion in September 1943. In June 1944 the division landed in Normandy where their victorious journey through Europe started. They fought in the Battle of the Bulge, closed the Ruhr-pocket, the Battle of Cologne, crossed the river Rhine and fought in the Battle of Dassau. They also liberated the Nordhausen labourcamp with it's V1 and V2 factories. For being always on the frontline, the divison got the nickname Spearhead. In November 1945 the division was, after a short time as occupation force, de-activated in Germany. In 1947 it was activated again as a training division untill 1956. From 1956 on the 3rd was 33 years in Germany. It was also the division in which Elvis Presley from 1958 till 1960 served his time. In 1990 the division served for the last time in Operation Desert Storm (1991) in Iraq. On August 15, 1992, budget cuts did what no enemy ever could, the division was de-activated permanently. It was March 30 1945, the 3rd Armored was closing Paderhorn, where a SS-trainingcamp was situated. The fast advance caused the division to be stretched and sometimes units were cut off. German forces raided behind the lines. Major-General Rose received word that one of its most forward units was cut off. He departed with his driver T5 Shaunce and his assistent Major Robert Bellinger in small column of jeeps and armored cars to find the unit. They drove through dusk over frozen roads, suddenly there were German tanks behind them and they were fired upon. They quickly took another road but coming around another curve they almost collided with yet another tank. They rolled out of the jeep and stood eye in eye with a Panther-tank. The hatch opened and a young German looked at them. For a moment there was silence, the German then screamed an order, but none of them understood German. The German pointed his Schmeisser automatic at T5 Shaunce, on that moment Major-General Rose dropped his hands to his waist, to his .45 caliber pistol. The German screamed, aimed and shot. Maurice Rose fell and his companions escaped. Rose was hit by 14 bullets. Later his 33rd tank battallion found him at the same spot. It is not clear if he wanted to unbuckle his pistol to surrender, or if he wanted to shoot it out. But looking at Maurice Roses's life up to then, he was not the type of guy to surrender. That day the Allied army lost a great man. Major-General Maurice Rose left behind a wife and 2 sons. His oldest son would step in his fathers path and become a Colonel at the US marine corps. 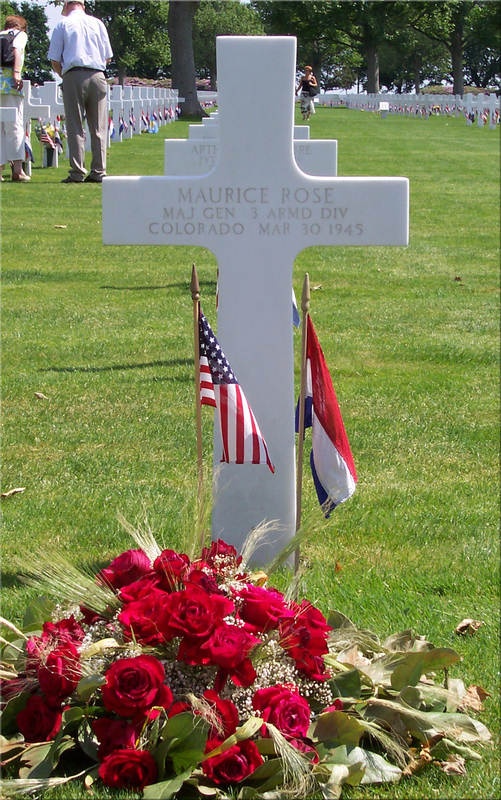 Maurice Rose was the highest officer in the US army with the Jewish faith. But he registered into the army as Christian, he believed that would be better for his career, thats why on his grave stands a cross and not a Star of David. He did not give much about faith, but he did always eat koosjer. They even believed that Rose was shot because he was Jewish, but the German soldier had no way of knowing that. Major-General Rose is the most decorated soldier buried at the Margraten cemetery. The Congress authorized the striking of a commemorative 50-cent piece. Also an elementary school in Margraten, a hospital in Denver and a US navy troop transportship were named after him. Major-General Rose was first buried in the US army Ittenbach cemetery, Germany, later he was reburied at the Margraten cemetery. 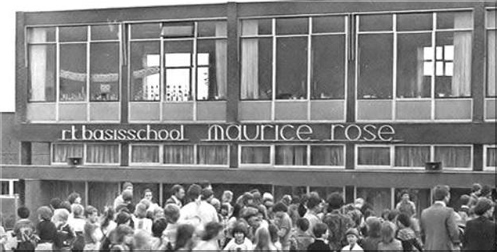 His grave is adopted by the Roman-Catholic elementary school " Maurice Rose" in Margraten, The Netherlands.